Congratulations on your performance and thank you for your participation in these tournaments that have just ended. These tournaments have been a great success, with the participation of a large number of players from across Canada, and a large number of players from home. 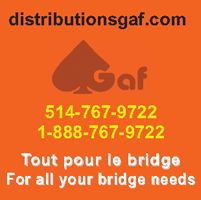 These tournaments under the aegis of the Canadian Bridge Federation, with the collaboration of the Montreal Bridge League, took place in Montreal from May 26 to June 3, 2018. Gold medal: Martin Caley, in this marathon with the Gartaganis team. Looking forward to seeing you at the next tournaments.